Murphy, who resides in Evergreen Park, is currently having an electrifying career with the Mission and is an up-and-coming star for Team USA. She has been on the U.S. Under-18 Women’s National Team for the past two years, capturing gold at the IIHF Under-18 Women’s World Championship in 2018. Once in awe of her idol, Murphy, 16, has become friends with the 26-year-old Coyne Schofield. “It’s been awesome to get to know her and be on the ice with her in the Chicagoland area,” Coyne Schofield said. “I’ve just been telling her to enjoy the moment, enjoy having on that USA jersey because it doesn’t come easy. Murphy has used Coyne Schofield as a valuable resource to answer questions and offer advice. Murphy is the future of American women’s hockey. The forward is a dynamic goal scorer who can do magical things with the puck on her stick. It’s still early in Murphy’s young, impressive hockey career. At the 10U level, Murphy played for the St. Jude Hockey Club. She then latched onto the Mission and has played at every age level from 12U on. Last year with the 16Us, Murphy helped the Mission capture a national championship. She is hoping to get back to nationals this April with the 19U squad. Playing for the Mission has really transformed Murphy into a complete hockey player. Murphy became a regular playing on Team USA squads in 2017. She has competed on the last two U.S. Under-18 Women’s Select Teams that play in an Under-18 Series against Canada. Murphy has also participated in the 2017 and ’18 USA Hockey Women’s National Festivals as well as been a member of the Girls U18 Select Player Development Camps the past two years. Switching off playing for the U.S. Under-18 Women’s National Team and the Mission has been interesting. Murphy also juggles her hectic hockey career with going to school. The junior at Mother McAuley Liberal Arts High School has had to miss a ton of school, especially during international trips. However, her teachers and administrators have been extremely supportive of her hockey dream. The biggest thrill of Murphy’s hockey career thus far was winning gold at the 2018 IIHF Under-18 Women’s World Championship in Dmitrov, Russia. 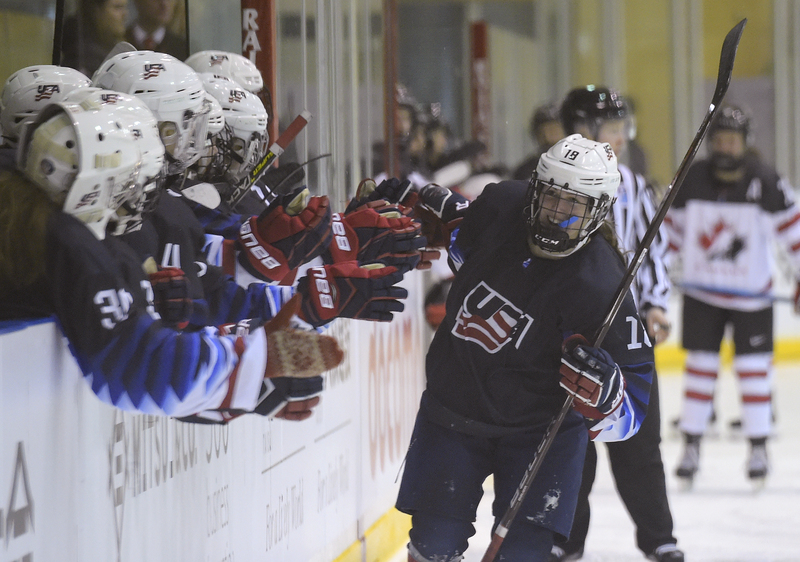 She had four goals and two assists in the tournament as the U.S. went a perfect 5-0. At 15, Murphy was the youngest player on the 2018 U.S. Under-18 Women’s National Team. This year, she’s one of the veterans and leaders, which is a role she really enjoys. It’s been quite the hockey journey thus far for Murphy, and it’s just beginning. She’s already attracted the attention of young Chicago-area girls hockey players with her dynamic play on the ice. “A lot of the younger kids look up to her and I think she’s starting to fill that role as a role model herself, which has been really, really cool to see,” Coyne Schofield said.